1837a Homalopsis leucobalia Schlegel, Essai sur la Physionomie des Serpens. 2:345. Type locality: Timor. Holotype: RNHL 1161. Collector: unknown. 1842 Fordonia leucobalia - Gray, Zoology Miscellany, p. 67. 1849 Fordonia unicolor Gray, Catalogue of Specimens of Snakes in the Collection of the British Museum, p. 77. Type locality: Borneo. Syntypes: BMNH 111.22.2.a. Collector: Sir Belcher. BMNH 111.22.2.b Lowe’s collection. 1854 Hemiodontus leucobalia - Duméril, Bibron and Duméril, Érpétologie générale… reptiles, 7:884. 1863 Hemiodontus chalybaeus Jan, Elanco systematico degli ofidi, p. 79. Type locality: Singapore. Holotype: possibly the Milan Museum. Collector: unknown. 1868 Fordonia bicolor Theobald, Journal of the Linnaean Society of Zoology 10:56. Type locality: near Rangoon (= Yangon, southern Myanmar.). Holotype: apparently lost. Collector: unknown. 1877 Fordonia papuensis Macleay, Proceedings of the Linnaean Society of New South Wales, 2:35. Type locality: Kataw, New Guinea. Holotype: Australian Museum. Collector: unknown. 1878 Fordonia variabilis Macleay, Proceedings of the Linnaean Society of New South Wales, 2:219. Type locality: Port Darwin, Australia. Syntypes: three specimens, Macleay Museum, Syndey? Collector: Mr. Spalding. The name leucobalia, is from the Greek leuco meaning white, and balios meaning spotted, dappled or piebald. This description fits several of the color morphs from northern Australia that may be black and white spotted, or a morph with red, black, and white spots; and it seems likely that the color morph is also present at the type locality, Timor, Indonesia. At the western edge of its range Fordonia is known from India’s Nicobar Islands, and on the coastal mainland from Bangladesh and Myanmar it ranges eastward along the coasts of islands and the mainland throughout Southeast Asia to the Philippines, and southward to New Guinea and Northern Australia. 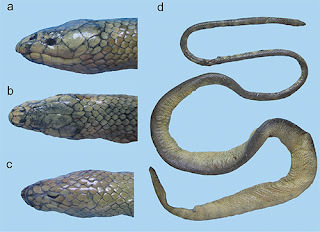 It should be emphasized that like other coastal marine homalopsids this snake probably does not occur inland or in open ocean environments accept as waifs. In Southeast Asia Fordonia is almost always a uniform black with a white belly, however in Australia, New Guinea and possibly in extreme eastern Indonesia (Timor) it has multiple color morphs. Fordonia has 23 - 27 scale rows at midbody but the most frequently encountered count is 25 rows (85%); it also has 5 - 7 (usually six) upper labials, a low count for a homalopsid; and it usually lacks a loreal scale. Additionally, Fordonia has an internasal scale that completely separates the two nasal scales, a character state that will immediately separate if from all Enhydris. In its mangrove and mud flat habitat it is most likely to be confused with Gerarda prevostiana which also has a uniform black dorsum over most of its range. However, Gerarda has 17 scale rows at midbody. Fordonia has also been mistaken for Enhydris punctata that has a similar number of scale rows at midbody, but it possesses a loreal scale, has 12 or more upper labials, and nasal scales that contact each other.